The Mayanot Blog: Sydney's Unlikely Journey to Mayanot! Sydney's Unlikely Journey to Mayanot! Hello everyone and good Shabbos. This winter-break I had the opportunity to spend three amazing weeks in Jerusalem studying on a Mayanot program. The Mayanot program I attended was an all-girl yeshiva, or as the rabbi there would say ..it is not a religious program, but a Jewish studies program. But through Chabad on campus and the Sinai scholar’s program I was exposed to a different view on Judaism that I found interesting and that I wanted to incorporate more of Judaism in my life. 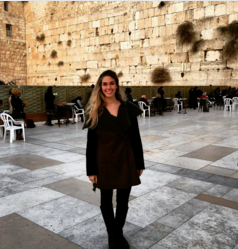 Getting off the plane at Ben-Gurion, I was very nervous because I was going into a yeshiva program without knowing anyone there, I had no idea what to expect and was worried that the other girls would not accept me because I was not raised “religious”.. It also didn’t help with the cab driver even ask me if I was in the right place because girls who go into this building are always wearing skirts… However, my expectations were totally inaccurate. The moment I walked through the gate of Mayanot, friendly faces greeted me as if I have been there for months and had just returned from a holiday. I felt so comfortable around these girls and the Mayanot community made me eager to learn right away. The girls in the program came from all different religious backgrounds and from all around the world and were there for the same purpose, to learn and study together. Since everyone grew up in different Jewish backgrounds this made the classroom discussions unique. Everyone brought something different to the table. And naturally the different classes spoke to us individually. My favorite class there was on Sunday mornings where we would learn about the torah portion of the week. While I was there, we were reading the Book of Exodus. Before Mayanot I barely knew what the book of exodus was about,sure I knew when it was when the Israelites were leaving Egypt, but I never knew or understood the main message behind it. Who would have thought that Moses was so humble that he was constantly asking Hashem why him, or the plagues had a significant reason behind them. Along with the Torah studies, we were also taught skills on how to be a Jewish women, and positive habits that we should incorporate into our lives to become more balanced . these classes encouraged giving and receiving in our relationships with family and friends. With these class we were taught skills from a book called the 7 habits of highly effective people. These habits ranged from being proactive=which means you can’t just sit around and expect things to happen….As well as having the end in mind and putting important things first. One of the first classes I was in we learned the story of Rabbi Akiva. Long story short. He was a man that was traditionally Jewish, however he was not educated in Jewish studies. At the age of 40, he was encouraged by his wife to go to school, where he learned for 14 years, and became one of the greatest rabbis in history. The moral of the story is. No matter of your background or religious background everyone has the potential to connect with their relationship to G-d. It sounds so cliché, but all of the classes that were in the program were truly incredible. The courses were taught by Rabbis and Rebbetzins that were so full of knowledge and enthusiastic about their subject it was impossible not to participate and want to learn. If you are interested in hearing more about the program, feel free to come up and ask me! I would definitely recommend the program to anyone that is interested in learning more about Judaism.